Susan Reynolds, a Catholic studies professor at Emory University, took to Twitter to describe something she witnessed during Mass on Sunday that she said was unlike anything she had ever seen before. In a series of tweets, Ms. Reynolds described an encounter between the pastor of St. Thomas More Catholic Church and a father at Mass with his young son, who is on the verge of making his first Communion. 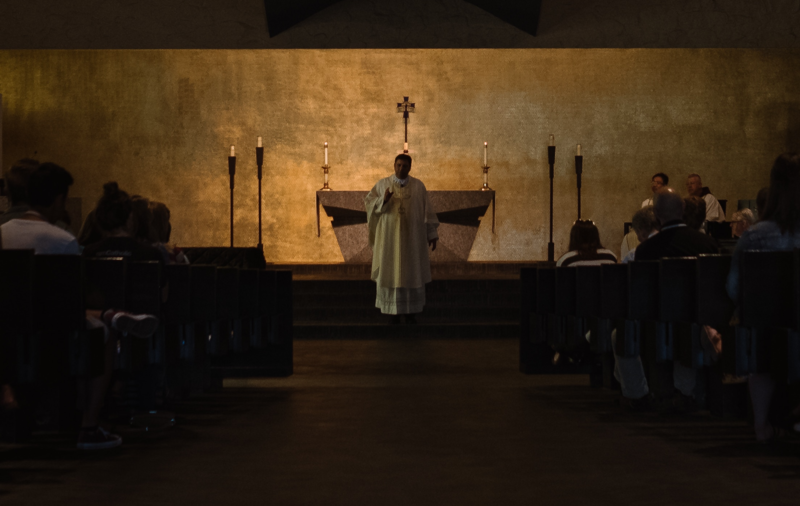 The priest, Mark Horak, S.J., had just delivered his homily, which was devoted to the news that 300 priests have been named in a grand jury report chronicling the sexual assault of more than 1,000 victims in Pennsylvania. Father Horak apologized to those feeling angry and let down by church leaders, and he lamented that lay people were not empowered to do more in the church. In some ways, it was a call to action. Ms. Reynolds said that “jaws dropped” when the young father stood up. Ms. Reynolds said that “jaws dropped” when the young father stood up. After all, she said, the Mass is not a common setting for dialogue between priests and laity. But instead of asking the parishioner to have a seat or even thanking him for engaging but urging him to wait to talk until after Mass, Father Horak took a moment to gather his thoughts before he tried to respond. The priest urged the parishioner to focus on the Eucharist—and not on the institutional church. But the priest also relayed some ideas he has heard lay people say could help express their anger: withhold donations, write to the bishops or sign a petition. He conceded that because of the church’s structure, there is only so much lay people can do. Ms. Reynolds said the exchange lasted about 10 minutes. Reaction from lay Catholics to the latest revelations of clergy sexual abuse and the cover-up by bishops has included calls for bishops—including Cardinal Donald Wuerl, the archbishop of Washington, D.C., whose handling of sexual abuse while bishop of Pittsburgh is criticized in the report—to resign. That is a response Ms. Reynolds favors. Following the release of the report, she wrote and invited Catholic theologians, educators and lay leaders to sign an open letter inviting all U.S. bishops to submit their resignations to Pope Francis, following the lead of bishops in Chile dealing with the fallout from their own sexual abuse scandal. Over 4,400 have signed on as of Aug. 20. “Those in power have not adequately expressed their own shame, their own sorrow, their own horrors and their own complicity,” Ms. Reynolds said. While new policies and structural reforms are necessary and appear to be working, she said bishops have not engaged in “an authentic demonstration of repentance” for the church’s mishandling of sexual abuse. She acknowledged that such an act is unlikely and that it is even more improbable that the pope would accept hundreds of resignations en masse. But for a religion that is imbued with symbolism, such a move would help heal the rift between lay people and church leaders. “This isn’t a few bad apples,” Ms. Reynolds said, describing the challenge facing the church as “structural sin” that cannot be fixed by even well-meaning bishops. For his part, Father Horak says while he maintains hope, he has yet to see the church make the kinds of structural changes required to empower the laity and prevent future instances of abuse and cover up. “You can change the people, you can change the players, you can adopt new procedures, but until that culture changes, I don’t have a lot of hope,” he said. But, he said, he hears many priests and even some bishops saying they also support the kinds of reforms that he and Ms. Reynolds advocate. “Somebody has got to take some bold, prophetic action that rocks the boat,” he said. Good response from Fr. Horak. On the other hand, another priest in Indiana was beaten up just for being a priest. https://www.cnn.com/2018/08/22/us/indiana-priest-beaten-trnd/index.html. Apparently it has escaped the general public's attention that the PA Grand Jury was essentially an historical evaluation (before 2000) and the number of reported cases since the Dallas Charter was implemented is less in the Church than almost anywhere else. And its not 300 priests named. Some are seminarians and brothers. The PA Grand Jury named 26 priests in 2011. 11 were found innocent and returned to their priestly functions. We will never know how many of these historical cases are unsubstantiated, since there will be no criminal investigation. And you've just identified the crux of this whole problem: it's an insane mess... brought to us by a century (or more) of secrecy. If there is one pearl we walk away with from the scandal in the Legionaries of Christ, it should be their 4th vow of secrecy- to never speak ill of any superior. Darkness thrives in the shadows of secrecy. you keep working away on those numbers TOL and you'll soon have them down so low you'll be able to claim that RCC does not have an abuse problem at all, it is all just more catholic bashing from the media--right? Why do I get the impression that you are Cardinal McCarrick's PR agent? I like the Idea of withholding donations as a method to obtaining real change " in the church’s structure, the church’s way of governing...…. church’s clerical culture.” Perhaps that would be a true incentive the "church" could feel. It sounds so simple - withhold contributions until "they get the message." A number of churches are already suffering from a lack of adequate financing. Church membership is down, church members are aging, young people are declaring that they don't need a church or a religion to be "good people." Put that all in the basket with an economic punishment, and what you will see is the closure of churches. The faithful of those closed parishes, if they choose to stay with the Catholic Church, will be forced to drive to neighboring parishes, maybe some extraordinary distance away, in order to receive the Eucharist and attend Mass. It's a feel good poke in the eye that you are advocating that may (will?) bring on unintended consequences that really hurt. Secrecy is the bane of the Catholic Church. Until that really changes, becomes really transparent nothing will truly be different. “There isn’t a whole lot you can do because lay people are not in positions of power in the church,” he said. “Basically you’re outsiders, and the only way you can influence is as an outsider.” I have been reading a marvelous book by Bob Ekland, A new Christian Manifesto. He ministers to the 'outsiders, the marginalized, the immigrants, the prisoners near Seattle. In his work he reminds those listening that Jesus was among the outsiders. Jesus, our model, not some priest, some past "saint" is our cynosure. Jesus was attacked by his contemporary Rabbis when He ate with "sinners and loved the outsiders." The very culture and structure of the Protestant and Catholic church establishes over and over the insider and outsider as Pope Francis calls it the "culture of death." Let us look at Jesus, fix our eyes upon Him Hebrews 13: 12 And so Jesus also suffered outside the city gate to make the people holy through his own blood. 13 Let us, then, go to him outside the camp, bearing the disgrace he bore. 14 For here we do not have an enduring city, but we are looking for the city that is to come. encouraging to hear that the father (the real 'father") was moved to speak publicly by the Holy Spirit--may his charism continue. This man is a humble prophet seeking justice. The church needs more people who are willing to lament publicly. Our “prayers of the faithful” are too sanitized. We need authentic and honest prayer, not just politicly correct soundbites. The Holy Spirit is working amoung us. I am surprised to discover that I am considered an "outsider", I was under the impression that we are all part of the body of Christ. If the clergy believe that "they" are the church and we are not, things are even more disordered than I thought. You've hit upon the ugly church. My rallying cry has been for years "Whose church is it?" The clergy, indeed, thinks it's their church. It is not - WE ARE THE CHURCH! We are the employer who hires them as employees to be our ministers. I sure wish we could get that relationship right. On the front cover of the church bulletin where my favorite priest was the pastor, it said in big bold letters: Employee - Fr. Joseph Black. And he acted like that too. So rare, and so wonderful! How can it be that a lay Catholic is an outsider to his/her own church? Lay Catholics ARE the Church. The laity are outsiders in terms of power. We have none. Priests, bishops, etc. have all the power. We in the pews also have responsibility. We have treated our priests as idols and, to our sorrow and shame, some have taken advantage of that idolatry. It is up to the laity to recognize our part in the scandal and to insist on repentance and reparation in the form a support to those who have been victims. Seems as though all priests were all directed to give the same homily last Sunday. The sins addressed certainly cry out to heaven for vengeance, but clearly vengeance is not what we need. We need more Father Horaks. Isn't this exchange precisely what Jesus had in mind as He formulated parable after parable to teach us? Horak did not preach from a position of power but rather responded as an equal, as someone painfully in touch with the hearts and minds of those in the pews. I went to St. Jerome's in LA this weekend and found the priest equally willing to be with us on our level, if you will, as he grappled with this Church wide tragedy. I actually think that believing lay people have all the power, all the authority, all the impetus they need to effect real change, and they have the means at their disposal to carry this out if only they will believe in themselves. Reynolds is correct in her assessment of what people want and don't want. No more finessed press releases, please. Contrition, yes. But more than that, maybe what used to be called a "firm purpose of amendment" which would entail listening, retreating to reflect, and then bold and daring action that puts lay people right where they belong, namely, on the forefront of ministry in the Church, doing all sorts of things once reserved for clergy. Jesus never attended a privileged class of only men to be the main ministers in the spread of the faith. And we in the pews are much more influenced daily by our interaction with the Fr. Horaks of this world than we are by any Vatican functionary or Cardinal, and Pope Francis knows this! The sooner we all smell like the sheep the better, and when that happens, maybe the children will no longer be targets for abuse, and maybe our women will take their rightful place leading us in worship. The more jaws that drop, the more the opportunity for the Eucharist to become the gift it has always been intended to be for us all.